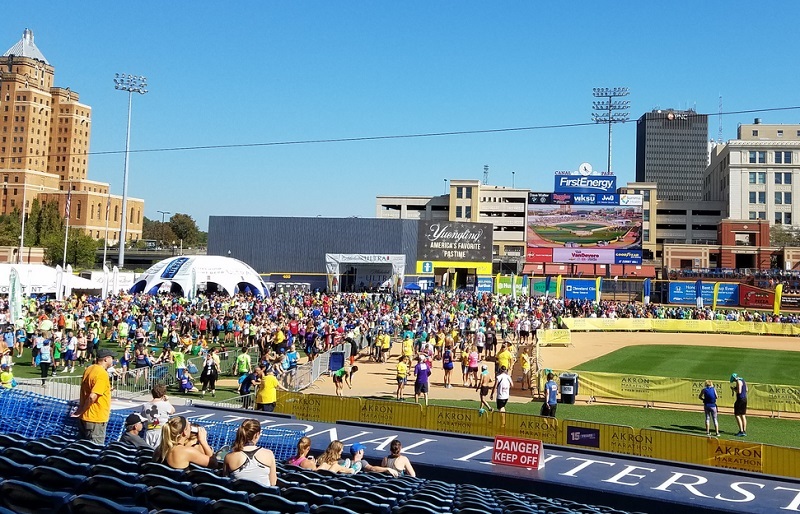 My last post covered our running of the half marathon in the Akron Marathon. I’m still so excited that we did it! Wow, it was fun. I think races might be more fun once they’re over. We did a lot of things right but now what we’ve run the race, I can see some things I’d do differently or just start to add to my training regime. We figured out how we needed to eat and drink when running long distances. We’d both only run shorter distances and so eating and drinking really hadn’t been a problem. Once you start running over an hour, you need to know how you’re going to get water and possibly some food. Once you’re running over two hours, food becomes essential.Chris introduced me to carrying orange slices. Wow, they’re like pure energy. You eat an orange slice and that sugar goes right to your blood stream and whamo, you’re energized.During the race, it was hot. A number of people were taken to the hospital for being dehydrated and having electrolytes out of whack. I didn’t drink the PowerAde available a the fluid stations. Chris did—she mixed it with her water to dilute the flavor—and she felt better at the end of the race than I did. I felt light-headed. Fortunately I had a packet of electrolyte stuff that you mix in with your water. I poured it into my water bottle and drank it down. I also ate some food and between all of that, I felt better.I need to do some research on the best way to fuel my body during a race. Chris and I collapsed on the field. I know all of the training plans we looked at said you don’t have to run the full distance to train but if I were to do it again, I’d get in a couple more long runs and I’d run the full 13 miles or even go up to 14 or 15. I think psychologically speaking, it would be easier to know that Id already run that distance or that I’d run further. Personally, I’d like’ to lose about 10 pounds before next year’s running season. It’s a lot easier to run without carrying extra weight. I gained weight this past year—too much eating at restaurants and drinking beer—and now I’d like to lose it. Now that I have this running base in place, I want to be sure to continue to run over the winter. I’m thinking that we need to register for a race in the spring to keep us motivated. The end result is that we registered for the half marathon, not knowing if we could do it but believing that we could. 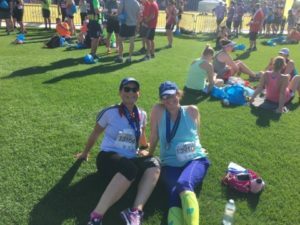 We trained like crazy, ran some additional races as part of our training, and then achieved our goal. Wow! I’m still amazed at it. I guess the big lesson here is that I’m planning on running another race!